We’re not sports-ing people, but if we were, we’d love NCAA March Madness. Those brackets look like so much fun that we had to make our own! There are many, many cars that have a similar GT-[fill in the blank] name, and many of them are among the finest creations ever to grace public roads and race tracks. Think Pontiac GTO, Porsche 911 GT3, or the Nissan GT-R. See what we’re getting at? 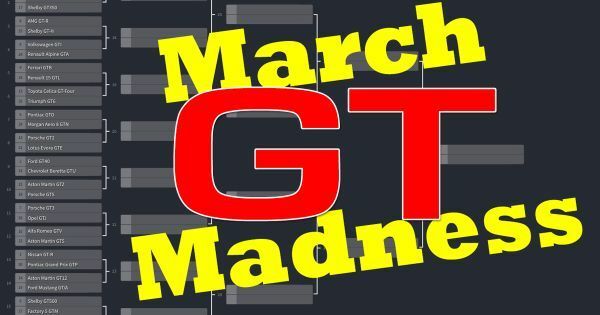 We compiled a list of 32 cars with these GT_ names and for the next two weeks you will get to vote which is your favourite. Just like basketball, we’re starting off by pitting the high seeds (most popular, iconic cars) against the low seeds (lesser known cars). But who knows, maybe there will be an upset or two? Welcome to probably the biggest blowout of this entire thing. The GT40 is the stuff of legend, a three-time Le Mans winner and design icon. We like the iconic 1967 models the best. And the Chevy? The GTU is the go-fast version of the Beretta. I guess it has a four cylinder? I don’t really care. One fun fact is that the Beretta gun company sued Chevy for using the name and as part of the out of court settlement, they recieved a Beretta GTU which still sits in the gunmaker’s lobby. Which will you vote for? The Aston Martin DB4 is a great car from the prettiest period in racing. The ‘Z’ stands for “Zagato,” who rebodied the already-pretty DB4 to save weight and reduce drag down the Mulsanne straight. DB4 GTZs are some of the most valuable Astons ever made. Porsche has applied the ‘GTS’ to pretty much everything it makes, from a 911 to a Cayenne, and we picked the Cayman because of its small size and focused handling. The 718’s turbocharged flat-four doesn’t emit the same wail its flat-six predecessors did, but we’d still love to try it out along some mountain roads. Which gets your vote? The 911 GT3 is one of the best modern enthusiast cars, flat-out. Starting with the 996-generation 911 and until today, the GT3 has been defined by its race-bred naturally-aspirated flat-six engine. The newest one is available in a super-cool Touring trim sans wing; or as the hyper-aggressive GT3 RS. We’d take either. And in the other corner we have the diminutive and cute Opel GTJ. The ‘J’ stands for “Junior” and it was the budget-trim of the German Opel GT. The body looks like a 4/5ths-scale Corvette because it was designed by an American designer from GM. Which gets your vote? The Alfa Romeo GTV is possibly the prettiest four-cylinder coupe ever made. It also has an elegant interior and a soulful twin-cam engine. The GTV was a successful SCCA racer, too, with plenty of competition pedigree. For the GTS, it’s true, we could have chosen any number of different Porsches or Ferraris, but we decided to change it up with an Aston entry. The 2016 Aston Martin Vantage GTS slotted above the GT model and below the S model. It features a 4.7-litre V8 engine, and one of the sweetest bodies in modern times. Which will you vote for?